It is almost foodie sacrilege to suggest that a group of colorful, antioxidant rich vegetables ubiquitous within the Western diet might not be as healthy as the natural food community paints them to be. This is exactly what this article is going to attempt to do – wade you through the process of considering whether nightshade vegetables might in fact be worsening your health symptoms even if they are grown organically in nutrient dense soil. Hopefully not, as nightshade veggies are delicious! But, it makes sense to investigate the possibility especially if you have issues with chronic pain, arthritis, or GERD among other challenges..
First, let’s examine exactly what the nightshades are and what health problems they sometimes exacerbate for those who are sensitive. 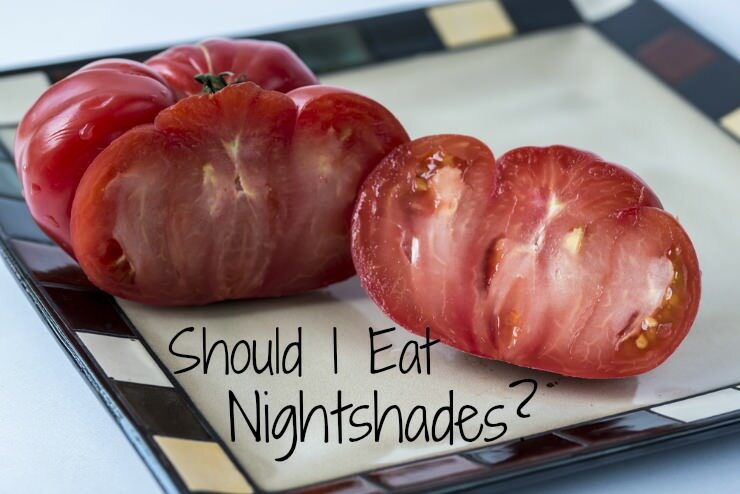 What are the Nightshade Vegetables? It really is hard to imagine that these delicious and antioxidant rich vegetables and fruits might in fact be worsening some very serious health challenges even if they are not the true cause of the problem. Why does a nightshade sensitivity contribute to these health challenges? The problem stems from several chemicals in nightshades, one that will undoubtedly shock you as it did me. Believe it or not, all nightshades contain nicotine, the addictive stimulant also found in the tobacco plant. This is why many folks crave nightshade vegetables and fruits and find it hard to eliminate them from the diet in attempts to see if symptoms will improve. My grandmother was addicted to tomatoes, so much so that it seemed hard for her to go a single day without slicing one up and eating it just like an apple. She also suffered from osteoarthritis. I’ve often wondered if she actually suffered from a nightshade sensitivity. Nicotine is known to inhibit proper healing such as a rotator cuff tear or knee injury. If you have an injury that doesn’t seem to be healing fast enough, elimination of nightshades for a time may help things along (1). Solanine is a poison found in nightshade vegetables, particularly potatoes and eggplant. Solanine is naturally produced by the potato as a defense against insects, disease, and animals. Exposure to light increases solanine production as this helps prevent a potato which is out of the ground from being eaten. This process turns the potato green under the skin. If your potatoes look green when you peel them or have sprouted, be sure to discard as they are likely too high in solanine for safe consumption. Frying or boiling potatoes effectively reduces (but does not eliminate) solanine in potatoes as it moves out of the potatoes into the frying oil or water. Microwaving or baking potatoes does not seem to reduce solanine levels appreciably. The reason solanine is considered poisonous is because it inhibits the breakdown of the neurotransmitter acetylcholine which can prolong muscle contractions. One commonly observed result is stiffness in the morning or after sitting for extended periods of time. Some holistic physicians are so concerned about the solanine levels in potatoes and eggplants that they advise pregnant women to avoid them. This is due to research linking the potato blight in Ireland with birth defects in subsequent years (2). Potato blight causes a higher than normal production of solanine by the potato plant. Calcinosis is a condition that involves calcification of the soft tissues. Nightshades can contribute to this condition because they contain calcitriol, a very powerful hormone, possibly the most powerful in the human body. The purpose of calcitriol is to signal the intestines to absorb calcium from the food that has been consumed. This is, of course, a critical function and necessary to maintain proper bone density. It just gets problematic when there is too much calcitriol for the body to deal with via normal channels. The kidneys very tightly regulate calcitriol production because too much from any source leads to high blood calcium, also known as hypercalcemia. When hypercalcemia occurs, the body attempts to bring everything back into balance as quickly as possible. This is because mineral imbalance in the blood such as what occurs with high blood calcium can negatively affect heart health. The fastest way for this to be accomplished is by depositing the excess calcium into the soft tissues, overriding kidney control of the process. These tiny calcium deposits can really add up over time and trigger calcinosis. The calcium deposits can occur in a wide variety of soft tissues including tendons, cartilage, kidneys, skin or blood vessels (coronary artery disease). Bypassing the kidney’s control over calcitriol levels which involves the emergency measure of depositing excess calcium in the soft tissues is very serious situation to have occur over long periods of time. Overconsumption of nightshade vegetables or fruits can contribute to the calcification process. Because the process is so gradual over long periods of time, many people may not notice the connection. If you suffer from osteoarthritis, bone spurs or other calcification of the soft tissues including skin, elimination of nightshades from the diet should definitely be considered to observe whether pain and discomfort is reduced. If after reading the above, you think it might be worth a shot to eliminate nightshades for a short period of time to see if things improve, know that it will be a trickier task than you might initially expect. Another nightshade to watch out for is paprika as it is used in many flavorings and hidden under “spices” on food labels. If you are trying to avoid nightshades for a time to see if symptoms improve, particularly for arthritis pain, you will likely need to avoid any food that lists “spices” on the ingredients list. Garrett Smith, a Naturopathic MD, suggests going completely off nightshades for a minimum of 6 weeks to see if pain symptoms subside (2). Many people will notice an improvement in their osteoarthritic pain or other symptoms; in some cases it may disappear completely. If no appreciable improvement is noticed after that period of time, Dr. Smith recommends what he calls a “nighshades party day” with nightshades consumed at every meal for a 24 hour period. An example would be salsa and eggs for breakfast, tomato and eggplant for lunch, potatoes for dinner. Eat it all and eat a lot. Then, stop eating them again and watch symptoms over the next two days as there can be a delayed reaction. An interesting question to ponder is why are some people more sensitive to nightshades than others? Dr. Smith suggests that nutrient deficiencies as well as genetics play a role in all of this. For instance, being magnesium or Vitamin D deficient renders one more susceptible to calcinosis. However, the efficiency with which the liver and kidneys detoxify plays a big role as well and this is based on one’s heritage and vital organ health at birth. One nutrient to strongly consider supplementing with if calcification issues are a problem is Vitamin K2. This fat soluble wonder vitamin has already been shown to reverse calcification of the coronary arteries (3). In research on rats, K2 prevented calcification of the soft tissues when excessive Vitamin D2 was supplemented in the diet (4). So, if you love your nightshades and don’t want to experience any negative effects from eating them frequently, be sure to consume adequate Vitamin K2. The foods highest in K2 are (in order): natto, goose liver, emu oil, brie and gouda cheese, and grassfed butter. In addition, a supplement of Vitamin K2 should also be carefully considered. This is the nonGMO K2 supplement we take in our family on a daily basis along with grassfed butter oil and emu oil capsules. Taking chances with calcification anywhere in the body is a big risk whether or not someone chooses to eat nightshades. In particular, if there are calcification issues genetically within your family already even with no symptoms appearing at the present time, adequate intake of Vitamin K2 is quite possibly the most positive preventative step you can take.